A passe-partout for every moment of the day, the suite separates in linen: a crisp and flattering compromise. This suit separates is realized with crisp fabrics: 100% linen and 100% cotton. 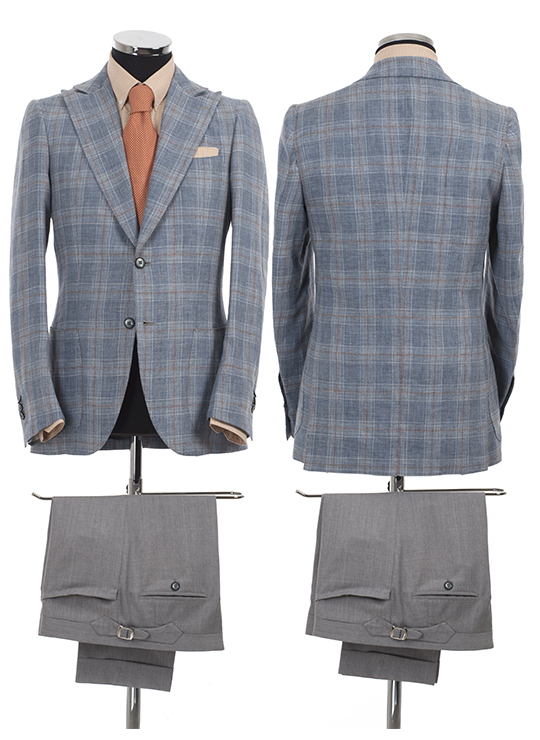 The jacket has been shaped with peak lapels and refined with patch pockets and breast pocket “a barchetta”. In realizing this suit, we focused on details and realized pants with no belt loops and pockets “a carrettiere”. It’s not the classical belt, but confortable waist cincher-buckles and side buttons. The matched shirt in cotton is handmade and custom-tailored. In the same fabric as the shirt, we realized the pocket square. And for a less formal occasion, you can just address to our poschette. The result is an informal and comfortable suit, but stylish and flattering as well. Jacket: 100% Linen, Naphthenic Cut, Two Button. Trousers: 100% cotton, no belt, straight pocket. Shirt: Cotton 100%, Classic cut, without pocket.